On a fairly sleepy commercial stretch of Avenue X in Gravesend and named after the daughter of the owners, Cafe Sabina has opened up in the former home of Turkish restaurant Wood Spoon. The gates were down over the windows and half-covering the door when I first showed up at 12:45pm on a Monday. Sitting across the street forming a plan B, everything popped up and suddenly they decided to serve food for the day. A sign on the front door confirmed what the internet had suggested: 10am was the supposed opening hour. It was easy to see the reason after entering, as multiple tables were covered with what appeared to be a very large catering order. This had probably forced them to use all their manpower in preparation. Regardless, it was only a 10 minute delay and I was happy to take a seat near the window even if the proprietor shrugged his shoulders at my presence. The shades inside Cafe Sabina range from purplish-pink to pinkish-purple, with purple artwork and a pink menu as well. Once they have a customer, the TV gets set to a Russian pop video Youtube channel. In Russian, the sign outside advertises "Eastern" and "European" food, which is shorthand in Russian for "Uzbek" and "Russian" cuisine. The menu also veers a little bit all over the place, with a Ukrainian soup, a Georgian entree, and Korean influences like many Uzbek eateries. 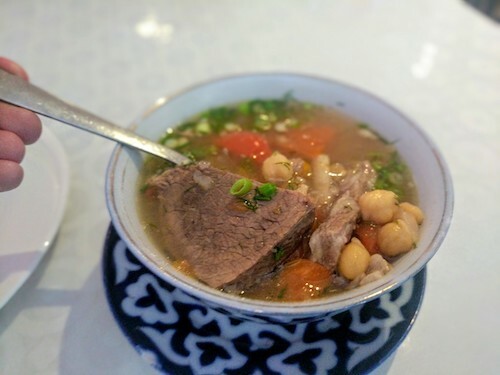 This meal started with a nice bowl of shurpa ($6.50, above and below), a name derived from Persian meaning "salty stew." The thin broth indeed fits that bill, the type of meal you crave when you are sick. 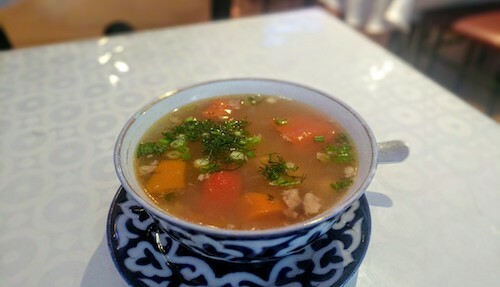 It is a soup enjoyed from the Balkans and Northern Africa in the west all the way to South Asia in the east. Chunks of beef, chickpeas, and orange bell peppers make up most of the volume, while dill is the most prominent taste. 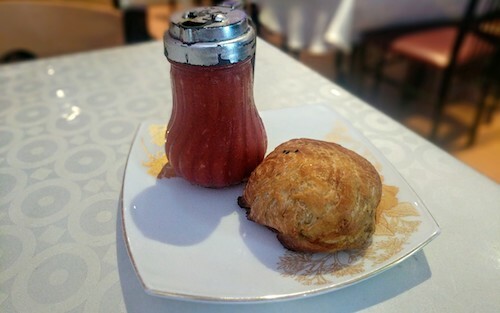 The order of a single tandir samsa ($2.50, below) was pulled out of the catering trays before coming to the table. I was having a hard time not laughing at this, knowing my pastry was going to be fresh but that others would be missing one. This version had a thick and very crisp blackened bottom, almost as if it had been left in the tandir oven slightly too long, but not in a bad way. The lamb inside was a bit tough, but the spicing is excellent. An order of at least a half dozen should have been immediately placed. 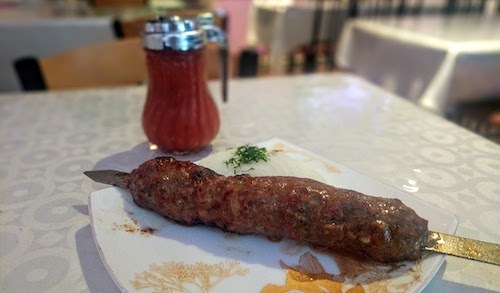 More delicious lamb made its way to the table in the form of a lyulya kebab ($4.50, below), the ubiquitous ground meat shish kebab found in most Central Asian eateries. Discussions online are amazing concerning most foods, but the peculiar nature of lyulya kebab enthusiasts is particularly funny with most people decidedly unhappy at 99% of the versions they eat, but knowing that 1% is worth the trouble. I am easier to please when it comes to this dish, almost always enjoying my lyulya kebab. Here at Cafe Sabina this is no different. And as an added bonus, their tomato sauce is actually quite good. I usually pass on this bland sauce served with every kebab, but thankfully gave it a shot here. Full of spice from garlic and plenty of depth from other herbs, don't make the mistake of not trying it here. Just maybe not before a first date.